Now that the #RhodiaPaperProject happens ever other week, I think I anticipate the arrival of paper samples twice as much. I was glad to receive Week 14 samples in the mail a few days ago and to try out various inks on them this evening. Although 80g paper is perfectly usable, it's a tad too flimsy. As in the past, the 90g paper once again turned up as my favorite. My description of this paper in a previous post, applies equally well to this week's 90g samples, which possess "a solid weightiness that isn't too heavy." It's this paper that stands "up well to thick, liquid inks," which are my preference as well. Despite its excellent weight and the way it took ink from numerous pens, I did not love the Clairefontaine Pastel Grid for two reasons. First, I found the "tab" on the right side to be a distraction. It's paper, not a file folder, after all, and I would much prefer a clean, straight edge. Second, the lack of a perforation to remove the scraggliness where the paper had been ripped from a spiral bound book was, well, just plain annoying. 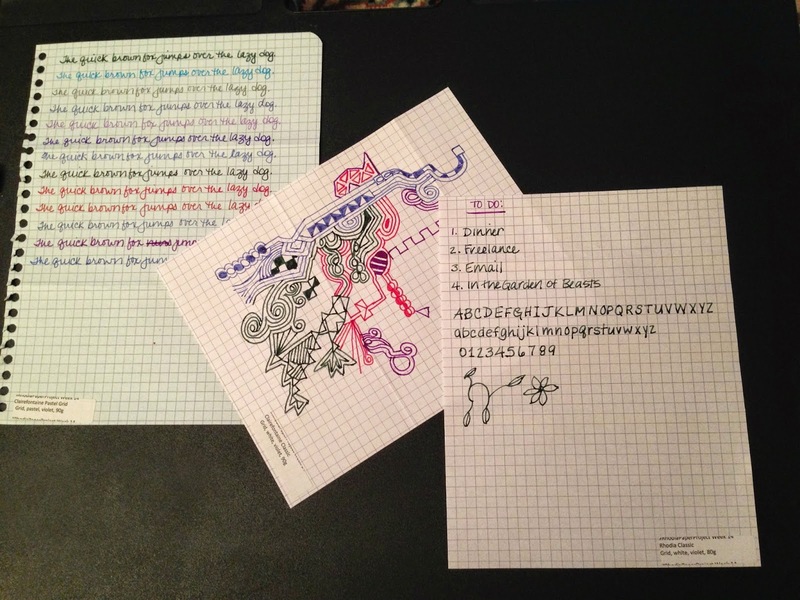 Without a doubt, the Clairefontaine Classic Grid, white, violet, 90g was my favorite in this batch of samples. A full pad would be the perfect accessory next to my laptop -- ever ready to take a quick note, a to-do list, or a random thought that doesn't necessarily belong in an electronic document.